Police investigating the serious car accident this morning on Route 443 northwest of Jerusalem found that the accident apparently transpired following another smaller accident nearby. Two women were killed in the accident and another 41 people were injured. Investigations indicate that prior to the fatal accident, another accident took place between two vehicles in the lane heading from Beit Horon to Modi’in. 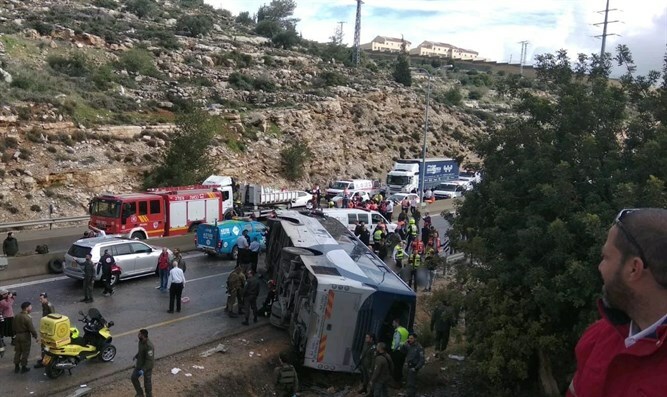 A passenger van in the opposite lane, heading toward Jerusalem, then perceived the accident and stopped on the left side of the lane, with the intent of providing aid at the scene of the accident. At this point, a bus following the van hit the van and flipped over on its side, skidding into a ditch and hitting the safety rail.